If you’re looking for tips to help make learning spelling easier, as well as some super fun spelling activities and games to use in the classroom and at home, this post is for you! I have been blessed with a child who loves to read, and while spelling isn’t something we struggle with, homework is still a process and I kinda sorta geek out over trying to find ways to make learning fun. I want my sweet girl to develop a passion for learning, which oftentimes requires me to think outside the box and get creative when it comes to getting her excited about homework. It certainly takes a bit of upfront work on my part, but if I’ve learned anything in the past ~8 years of motherhood, it’s the importance of keeping things engaging. The more positive and interesting I make things, the easier they are to tackle, so it’s worth the time commitment. Keep reading for my best tips to make learning spelling easier, as well as 18 spelling activities and games your little one will love. When Do Kids Learn to Spell? While researching for this post, I was surprised at how difficult it was to find a definitive answer regarding what age kids learn to spell, but the more I thought about it, the more I realized that this is a highly subjective question. All children develop at their own pace, and not all teaching methods approach spelling in the same way, which makes this a difficult question to answer. With that said, the literature seems to be consistent in suggesting that kids have the capacity to begin spelling lessons when they are around 5- to 6-years-old (first grade). While most kids this age are still phonetic spellers (they spell words exactly as they sound), this is around the time when phonemic awareness (the ability to hear single sounds within different words) starts to develop. Most 5- to 6-year-olds can spell their own name, and begin working on spelling CVC (consonant-vowel-consonant) words like CAT, DAD, and FAN. When I think back to my own spelling lessons as a kid, I remember being given a list of totally unrelated words to memorize each week in preparation for a test on Monday morning. I have memories of my mom quizzing me over and over again, and while I was a fairly decent speller, there were always a few words that tripped me up and I didn’t always remember how to spell the words once the test was over and done with. Now that I’m a mom myself, I can see how flawed this method was. While rote learning – or memorization as we often call it – helps develop functional knowledge and allows our children to quickly recall facts for a test, it does very little to develop their meaningful learning skills – the ability to retain the information they’ve learned and transfer this knowledge to other situations. If you’re looking for a better method to help your child learn and retain his or her spelling words each week, these tips for teaching spelling are a great place to start. 1. Read often with your child. The more your child reads, the more he or she will be exposed to spelling words, so be sure to encourage this activity as much as possible. You can even make it a game to point out sight words and spelling words while reading together, and discuss what each word means to help your little one understand and retain the information you are trying to teach. 2. Focus on words with similar sounds. When I was in school, our spelling tests were often based on a particular theme we were learning about (days of the week, the different seasons, holiday-specific words, etc. ), but my daughter’s weekly spelling homework contains words with similar sounds instead. For example, this week she was learning the concept ‘ICK’, and her list included words like KICK, STICK, and CHOPSTICK. This has proven to be a much better approach as the lesson is less about memorization and more about learning a series of words that sound the same, which is much more meaningful (and easier!). 3. Keep spelling words somewhere visible. My daughter’s teacher keeps weekly spelling words on the board for a one-week period, and erases them the night before a spelling test to ensure the students are able to look at them and practice them multiple times throughout the week. They also write them out on a piece of paper, and bring the paper home, and if we were organized enough, we’d keep the list handy at all times as well (LOL)! Recite. Have your child verbally spell each spelling word to you. Magnetic letters. Say the spelling words out loud, and then have your child spell each word using a magnetic white board and magnetic letters. Write. Ask your child to spell each word after you’ve said it out loud. We used to use a combination of all 3 of these techniques for spelling homework, but I’ve found that the easiest strategy for my daughter is to write each word down. 5. Use spelling words in a sentence. This becomes much more important as your child gets older and starts learning more complex words, but I find it fun to use each spelling word in a silly sentence during homework practice to get my daughter used to the idea, and to keep it light and fun. 6. Create a story. Challenge your child to tell you a story – or write a story down on paper – using as many of his or her spelling words as possible, and then ask him or her to draw a picture to illustrate the story he or she is trying to tell. This helps the child form a more meaningful understanding of the words, rather than just memorizing them for a test. 7. Make it fun. It’s no secret that kids are more interested and willing to complete lessons and homework when it’s fun, so don’t be afraid to think outside the box and get creative. 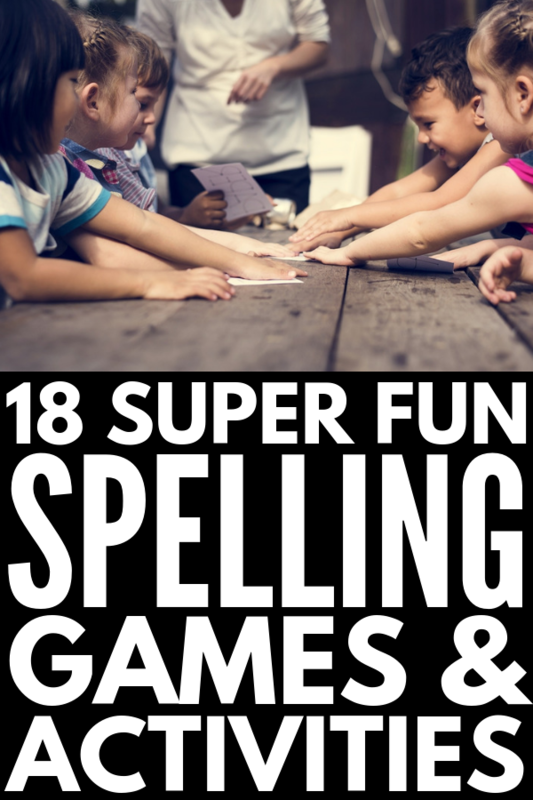 We’ve shared 18 of our favorite spelling activities and games below to inspire you! There are so many fun spelling activities and games you can use to help make learning spelling easier, and the complexity of these activities will obviously increase as your child ages. I’ve included a range of ideas below for elementary-aged kids. Some are perfect for beginning spellers, while others are more suited to kids in third or fourth grade. I hope this collection of teaching tips and spelling activities and games helps make learning spelling easier for your students and/or children. Remember to focus on meaningful versus rote learning, to practice often, and (more importantly) to keep it fun! If you found this collection of teaching tips and spelling activities and games helpful, please share this post on Pinterest! And if you’re looking for more activities to do with your kids, please follow our Kids board where we share all kinds of fun ideas we find each day!